The picture above shows a boulder of Hot Springs Sandstone with well-developed sigmoidal veins. Sigmoidal veins – sometimes called tension gashes – form in rock by shear stress. That’s stress that causes adjacent parts of a rock to slide past one another. 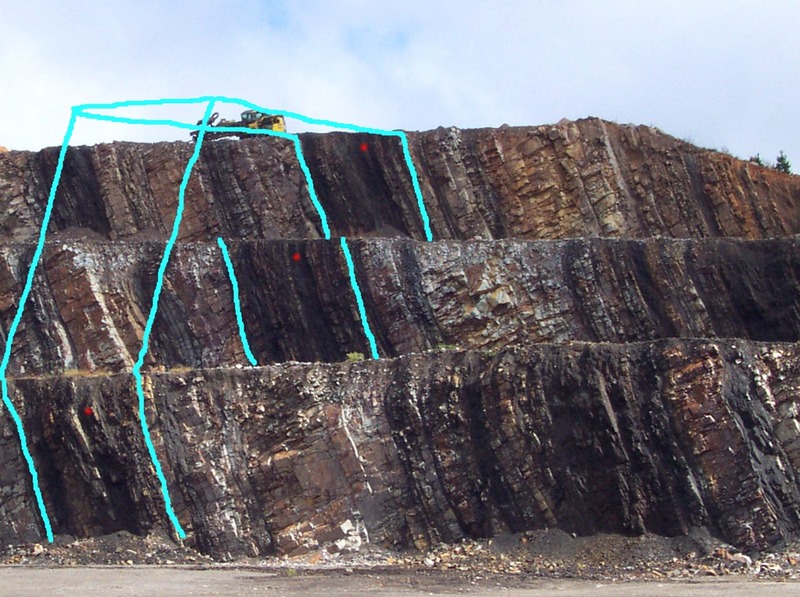 In the above picture the yellow arrows indicate the approximate orientation of the stresses that were applied to this boulder to create the sigmoidal veins. Sigmoidal veins, at their inception, are shaped like parallel lines that bulge toward the center and taper at the ends. They originate due to tension created between the two opposing forces acting on the rock. Essentially the rock tears to alleviate this tension. If the shearing continues long enough, these openings in the rock begin to rotate. The eventual shape, seen above, is like the letter S. The ends of each S point opposite of the direction of the force that created them. Therefore, sigmoidal veins can indicate the forces at work on bedrock when it was buried underground. The veins pictured here are at the edge of a parking lot next to the Arlington Hotel in Hot Springs Arkansas. After they developed the veins were in filled with quartz. The Hot Springs Sandstone is a member of the Mississippian Stanley Formation. This entry was posted in #geoblog, GeoPic of the Week and tagged Arkansas, deformation, Hot Springs, Shear Stress, Sigmoidal Veins, Stanley Formation, structural geology, tension gash on March 30, 2018 by argeology. Pictured above is Dardanelle Rock located on the south side of the Arkansas River between the towns of Dardanelle and Russellville. The white truck in the lower right corner shows the scale of this outcrop. It was designated a Natural Area by the Arkansas Natural Heritage Commission in 1976. The Arkansas River Valley is north of the Ouachita Mountains and is characterized by gently folded sedimentary rock that was subject, to a lesser extent, to the stress that folded the Ouachita Mountains. The rock pictured here is the south limb of a broad syncline, or down-warped fold. The north limb is about two miles to the northeast. The bedrock dips to the north (toward the white truck), goes sub-surface beneath the Arkansas River, then reverses dip direction and rises back to the surface just southwest of Russellville. If you could see a cross-section of the folded rock, it would look like giant a smiley face with the middle of the smile underground and the corners sticking up in opposite directions, two miles apart. This picture gives perspective to the colossal size of geologic features geologists study. Folds like this one, which can trap upward-migrating fluid, are sometimes rich oil and gas reservoirs. This entry was posted in #geoblog, GeoPic of the Week and tagged Arkansas, Arkansas River Valley, Dardanelle, deformation, dip, Russellville, structural geology, Syncline on March 13, 2017 by argeology. In this photo we are looking at rock beds, tilted till they are nearly vertical, and exposed in three levels in a quarry near Kirby, Arkansas, Ouachita Mountains. Like a humongous 3-step staircase, each ascending level of the outcrop provides a deeper view into the rock formation. An outcrop like this one illuminates a couple of basic but important concepts of geology: key beds, and strike and dip. The key beds or beds that can be traced across the outcrop, such as the one marked with red dots above, appear to shift to the right as your eyes ascend the steps. These are not faults! It’s an optical illusion. If our view were aligned parallel with the sides of the beds, they would appear aligned, but our view is actually diagonal to the bedding. To illustrate this, here is the same picture with a drawing of the key bed as if it were jutting out of the outcrop. 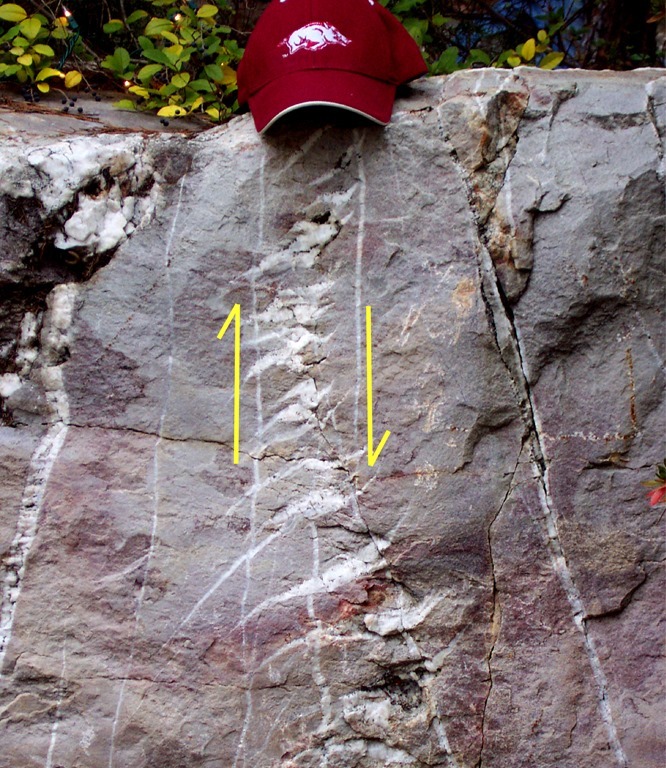 This is why geologists measure the orientation of rock beds – known as the bed’s strike and dip. Knowing how a bed is oriented in one place can help you to predict where it will be in another, perhaps inaccessible, place such as deep in the subsurface. If that bed is full of oil, gas, or other precious commodity, predicting where it is becomes very important. This entry was posted in #geoblog, GeoPic of the Week and tagged Arkansas, key beds, kirby, Ouachita Mountains, Strike and dip, structural geology on August 10, 2016 by argeology. This entry was posted in More Views and tagged Joints, limestone, orthogonal joints, sedimentary rock, structural geology on February 27, 2015 by argeology. Here is a photograph of Pitkin Limestone from the Ozark Mountains near Fox, Arkansas. This exposure displays a classic orthogonal joint set. 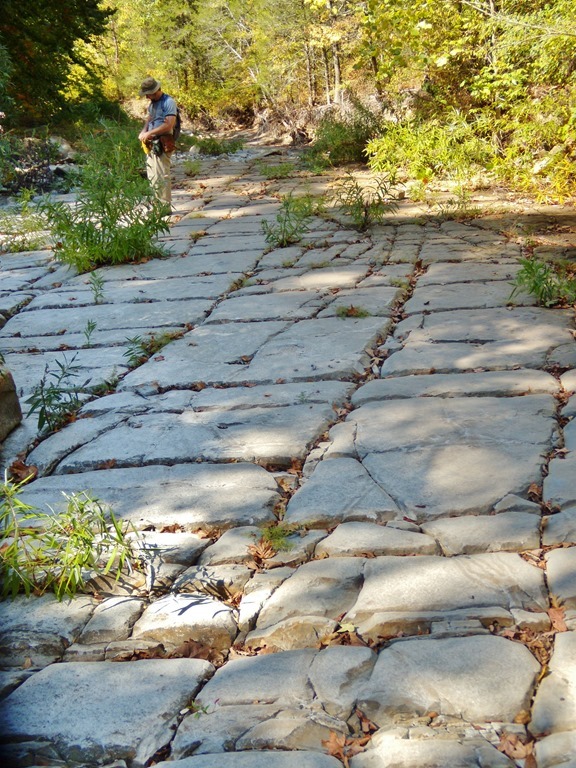 The joints are the easy-to-see fractures that divide the bedrock into square blocks. Orthogonal means the joints formed at roughly 90 degree angles to each other, hence the resultant square blocks. Joints are common features in sedimentary and crystalline bedrock, and they form in a variety of patterns in response to the stresses the rock has been subjected to. Essentially, bedrock is being compressed, and the joints form to relieve that pressure. The squeezing and resultant fracturing result from natural processes such as burial, erosion, and plate tectonics. Joints are important because they convey information about stress-fields that have acted on the rocks in the past. They can also be useful for understanding the flow of fluids through a petroleum reservoir or aquifer when trying to maximize production from an oil or water well. 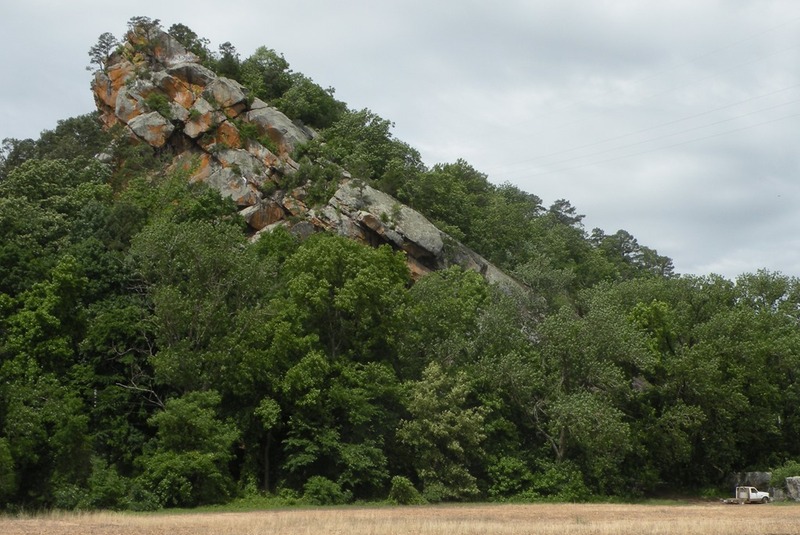 This entry was posted in #geoblog, GeoPic of the Week and tagged Arkansas, Cool photos, Geology, joint set, Joints, limestone, Mississippian, Ozark Mountains, science, structural geology on February 27, 2015 by argeology.